Owned by Miami’s own Emilio & Gloria Estefan, the golden couple of Latin music in Miami, sitting bayside behind the American Airlines Arena and boasting an atmosphere that won’t quit, it’s obvious that the energy is high at Bongo’s Cuban Cafe. This is the place to party al night and in Latin style, where deejays play all types of Caribbean music including salsa, merengue, bachata, reggaeton and regional Mexican music. It’s also a good place to catch Latin artists who attend after parties here. When Miami was host to the MTV Video Music Awards, Latin Grammys and Latin Billboard Music Awards the international artists attended after parties here. 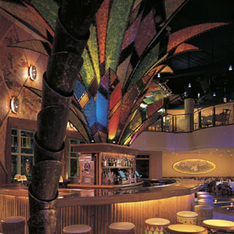 The interior decor, purposely filled with palm trees, bongo shaped tables and multi-faceted colorful lighting in bright Caribbean colors, is set up to evoke a tropical island feel.